As the holidays approach, I’m getting requests from readers for gift ideas. Instead of doing one-off replies, I thought I would publicly answer. Most people probably expect me to answer with some sort of cool gadget or tech toys. For those folks, I’d suggest the reasonably priced Amazon Dot. If you shop around, you can find places that are underselling Amazon like Best Buy. I haven’t tried Google Home yet so it wouldn’t be fair for me to recommend. But sometimes the best gifts are the ones that better you. And I’ve got three recommendations, but one is expiring. These type of “betterment gifts” rely on you knowing the recipient, which is why I prefer giving them to myself. If the concept of giving a gift to yourself seems strange, you can reframe this to be “investing in yourself”. This is the latest book from Tim Ferriss and it doesn’t have an expiration date. You can buy it at anytime. Again, I plunked down money and bought the Kindle version. If you know Tim’s previous books, it probably won’t surprise you that this book is 700 pages. This may also explain why the paperback version costs more than the hardcover. Just picking it up could be a workout for some. If you’re not familiar with Tim Ferriss, he’s the author of the Four Hour Workweek and an equally popular podcast. The book represents the best of his interviews and conversations with guests, many who became friends. Please don’t let the length scare you as it’s not meant to be read cover to cover. Instead, you can target by one of the 3 areas: Health, Wealth and Wisdom. It’s also one of the few books that has a dedicated section on how to use the book and its structure. What’s also appealing to me about this book, and with Michael above, is mistakes and failures are shared. It’s easy for us to think of these people as being “perfect” and everything worked flawlessly in their lives. And if you’re looking for products that Tim has mentioned in this book, there are a series of available “kits”. Kits are a curated collection of items. You can read a brief description and then there is a button that goes to some vendor like Amazon etc. It’s an interesting idea. What was interesting to me as I went through Michael’s course (mentioned below) and Tim’s book were the common denominators. Both referenced and respected the work of Brené Brown. New name to me. In doing some more research, I was directed to this free 20 minute TED talk that has some great insights and had me laughing at time despite the serious topic. 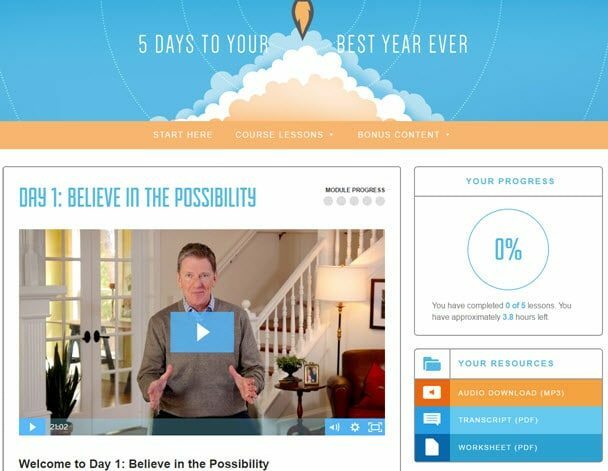 The first item I purchased was Michael Hyatt’s online course. It wasn’t even on my radar until I got an email asking if I’d like to be an affiliate. I hesitated as I had no knowledge of the course. But, I didn’t want to throw the baby out with the bath water if the content was good. That would be a disservice to you. Given that the course has a 30 day money back guarantee, there was little risk so I bought the course. Over the years, I’ve gone through a lot of goal setting courses, services and software. I expected this course to be similar. It’s not, which is good because the previous ones I tried had limited success. One early concern I had on this one was the reference to “5 Days”. Fortunately, it’s self-paced so you can do it in 5 days or 5 hours. It’s up to you. The only thing that has a hard deadline is the purchase date. You can only purchase the course through December 15th at 11:59PM PDT. If you miss that date, you have to wait till next year’s course. What I liked about this course is the flexible structure. In particular, each day has a ~20 min video, transcript and worksheet (action plan) with a series of exercises. The lessons are presented in a logical fashion. As a side note, the worksheets are editable PDF files. My suggestion if you use them in this manner (as opposed to printing) is to make a copy and then fill in your answers. As expected, there was overlap with some of the earlier courses I’ve taken. However, there were some significant differences and debunking of previous research. For example, I don’t recall a course asking me to look both backwards and forwards. And most importantly, it asked me to think about my “whys” or “motivations” for the goals. This is a great drill-down exercise.